I need to add and addendum to last month’s blog, “Why We collect Specimens.” Our Senior Collections Manager, Jens Vindum (GG I, GG II) has just informed me that since 2003, there have been 33 international scientific papers published on our Gulf of Guinea reptile and amphibian specimens and/or tissue samples from them! Clearly, the scientific world is beginning to hear about Sâo Tomé and Príncipe! At this point, I do not know how much of our material from other disciplines has been used but certainly our samples are in labs all over the world. 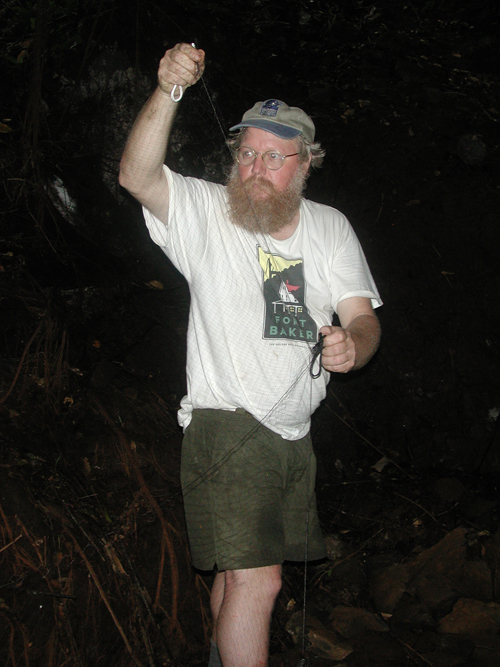 Lindsay Wilson was a participant on our 1998 expedition to Bioko, the first island in the Gulf of Guinea chain. 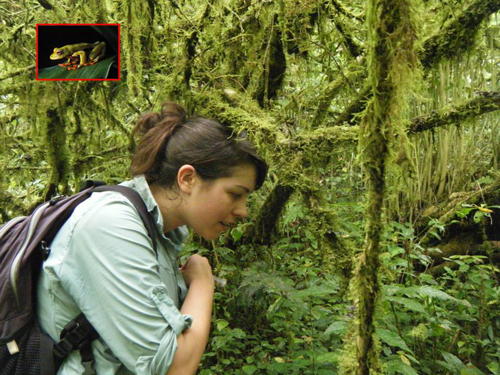 She completed her MSc on African treefrogs of the genus Hyperolius at San Francisco State University with highest honors. 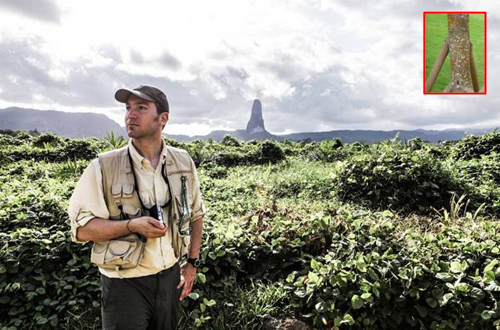 Joel Ledford joined Gulf of Guinea I as the graduate student of Dr. Charles Griswold. 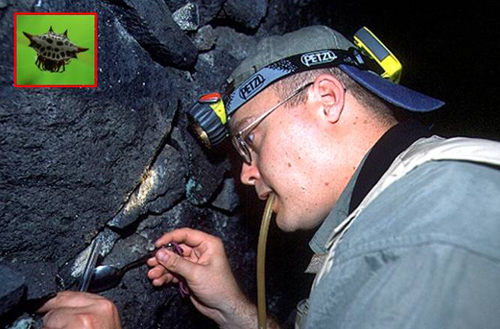 He completed his MSc at San Francisco State and then his PhD in spider systematics at the University of California, Berkeley. Also on GG I was Ricka Stoelting, my graduate student. She completed her MSC on the endemic caecilian of Sao Tome (she is holding one, above) and is currently a PhD candidate at the University of Wisconsin. She is also working on the publication of her MSc work at San Francisco State (SFSU). Dana Carrison-Stone was a participant of the marine expedition, GG III as the graduate student of Dr. Bob Van Syoc. Dana discovered two new species of barnacles from the islands and they are part of her MSc which she completed last year at SFSU. 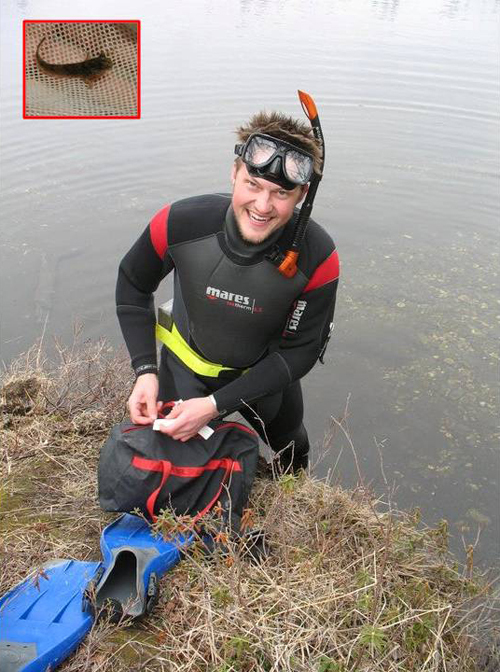 Mac Campbell, also a Willamette undergrad, joined GG II as an assistant to our ichthyologist, Dr. Tomio Iwamoto. He has since completed his MSc at University of Alaska, Fairbanks and is currently a PhD candidate in fish systematic at the same institution. 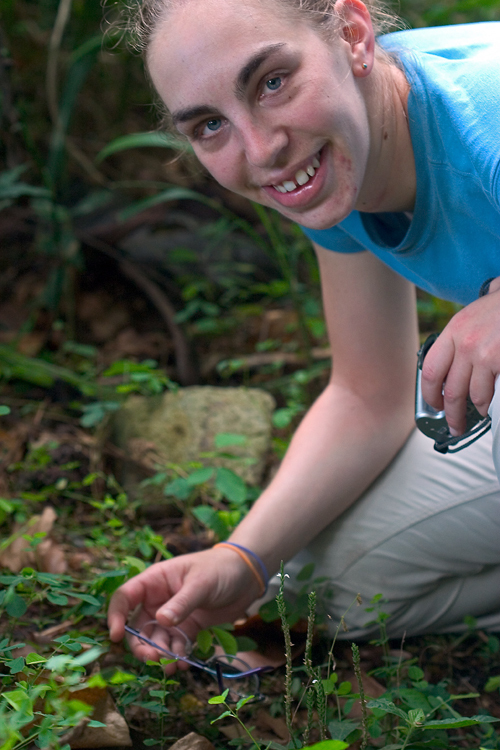 Rebecca Wenk joined GG III as the grad student of Dr. Tom Daniel one of our senior botanists. Rebecca’s work resulted in her successful completion of her MSc at SFSU and also an excellent scientific publication on plants of the family Acanthaceae. Tragically, Rebecca died of a serious illness last year. Miko Nadel is a graduate student at San Francisco State, studying under Dr. Dennis Desjardin, the mycologist on GG II and GG III). Miko was a participant on GG VI doing the first comprehensive survey of lichens on the island. 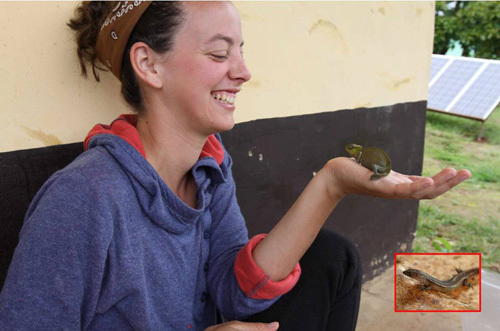 Rayna Bell also joined us on GG VI, studying color variation in African treefrogs. Rayna is a PhD candidate at Cornell University. The people above were or still are graduate students who have actually worked on the islands with us. 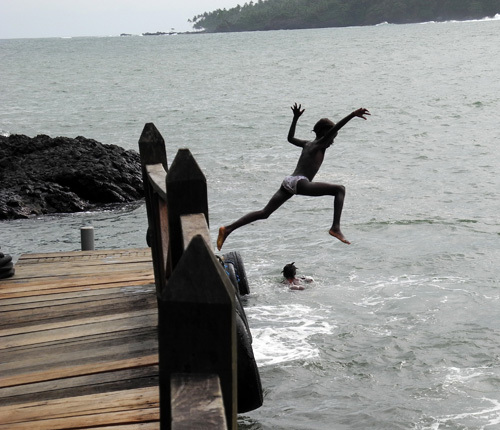 But they are not the only young academics studying our Gulf of Guinea Island material. Here at the California Academy of Sciences we have a program known as the Summer Systematics Institute (SSI). This program is funded by the National Science Foundation, and undergraduate students can apply to work on scientific projects for the summer under the mentorship of a CAS faculty member. Here are those that have worked on Gulf of Guinea specimens. I have not included students who started as undergrad SSI interns and later became our grad students (Lindsay Wilson, Josef Uyeda and Ricka Stoelting). Katie Marshall was an Occidental College undergrad and my SSI intern in 2006. 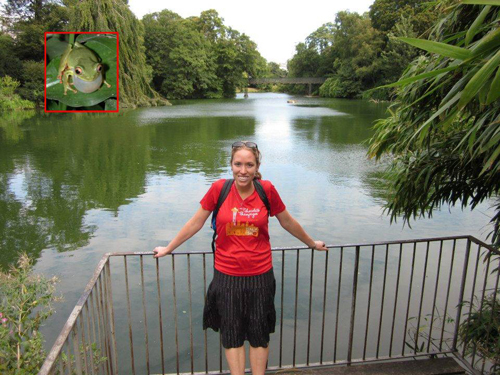 Katie studied the genetics of the Oceanic treefrog, Hyperolius molleri, the only Gulf of Guinea endemic frog that occurs on both islands. Katie is currently a PhD candidate at the University of Washington, studying the genomics of marine bacteria. Lisette Arellano was an undergrad at the University of California, Santa Barbara when she joined us as my SSI intern in 2009. 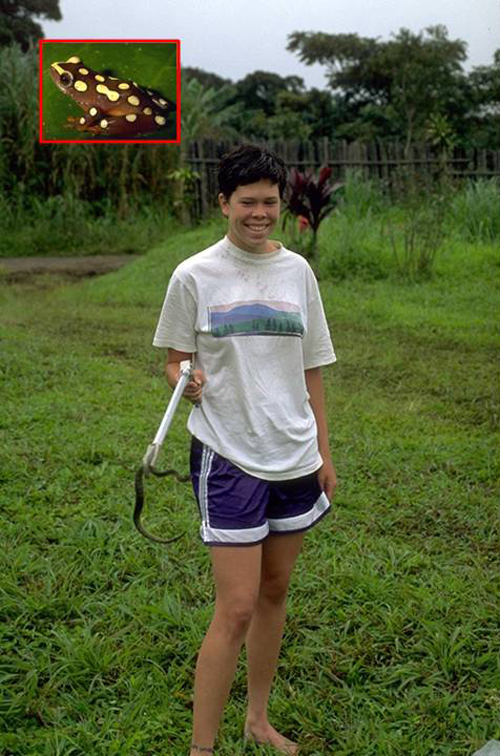 Lisette examined the morphology and genetics of cobra jita snakes (Lamprophis), long thought to be the same species on Sâo Tomé and Príncipe. Lisette showed that in fact the two island populations are genetically quite different, also recognizable by color pattern as distinct. Although we know each island is a different species, we have been unable to publish new names because the relationships of the same group on mainland Africa are still very unclear. 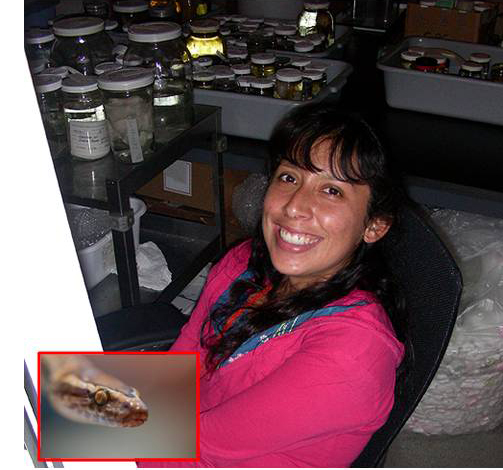 Lisette is currently a PhD candidate in Biology at the University of Colorado. One of the last vertebrates one would predict to be native to an oceanic island is a shrew, largely due to physiological constraints. During the SSI summer of 2010, Eden Maloney’s DNA work showed that the Sâo Tomé shrew, Crocidura thomensis, did arrive on the island naturally, probably many thousands of years ago and is a true endemic species. Its nearest relative is a different species found in eastern South Africa. Eden has just graduated from the University of California, Los Angeles and is applying to graduate schools. We are working on publishing her work. Lizzie Miller of the University of California, San Diego was my most recent SSI intern (2010). 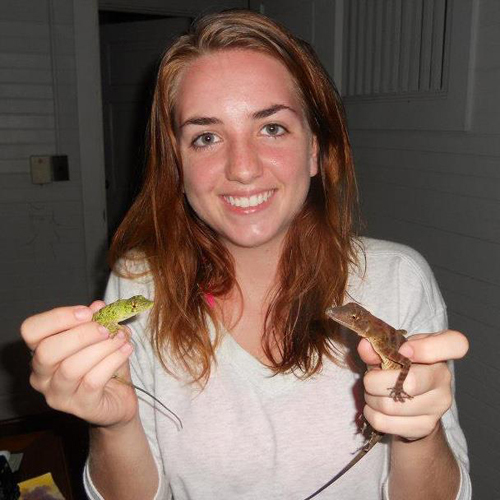 Lizzie has graduated and is now in graduate school at UCSD studying fish systematics. Readers will already know from this blog that Lizzie discovered and described a new species of gecko from Príncipe, Hemidactylus principensis. Lauren in Nigeria. D Blackburn phot – 2012. Lauren Scheinberg is also a grad student at San Francisco State University. Although never an SSI intern nor has she been with us to the islands, she was my lab assistant on a long-term physiology project and now works as a curatorial assistant in our department. She has become involved in a rather complicated taxonomic problem with the island skinks of the genus Afroablepharis. Like Lisette’s snakes, we know from the work of colleagues in Madeira and Portugal that the skinks are different species on Sâo Tomé and Príncipe. Unfortunately, material we loaned them that formed part of the basis of this hypothesis was somehow lost in transit. Lauren has analyzed our remaining material but collating the information generated by different labs can be extremely difficult. But we are working on it. Plans are already afoot for GG VII next year. We gratefully acknowledge the support of the G. Lindsay Field Research Fund, Hagey Research Venture Fund of the California Academy of Sciences, (GG I, II), the Société de Conservation et Développement (SCD) and Africa’s Eden for logistics, ground transportation and lodging (GG III-V), STePUP of Sao Tome http://www.stepup.st/, Arlindo de Ceita Carvalho, Director General, and Victor Bomfim, and Salvador Sousa Pontes of the Ministry of Environment, Republic of São Tomé and Príncipe for permission to collect and export specimens for study. Special thanks for the generosity of private individuals who made the GG III-V expeditions possible: George G. Breed, Gerry F. Ohrstrom, Timothy M. Muller, Mrs. W. H. V. Brooke, Mr. and Mrs. Michael Murakami, Hon. Richard C. Livermore, Prof. & Mrs. Evan C. Evans III, Mr. and Mrs. Robert M. Taylor, Velma and Michael Schnoll, and Sheila Farr Nielsen; GG VI supporters include HBD of Bom Bom and the Omali Lodge for logistics and lodging, The Herbst Foundation, The “Blackhawk Gang,” the Docent Council of the California Academy of Sciences in honor of Kathleen Lilienthal, Bernard S. Schulte, Corinne W. Abell, Prof. & Mrs. Evan C. Evans III, John and Judy Sears, John S. Livermore and Elton Welke.